For the past week or so, I have been taking an on-line course on High Dynamic Range Imaging. As mentioned in an earlier post, I am currently revisiting past photographs and using HDR techniques to re-imagine them. I recently learned a new technique for creating “pseudo-HDR grunge” images from single photos. This technique doesn’t work well for all images, but when it does, the results can be spectacular. This photo is one of my rediscoveries. I originally went to Dayton to shoot apple trees at harvest time. A friend took me to one of the orchards and introduced me to the growers. 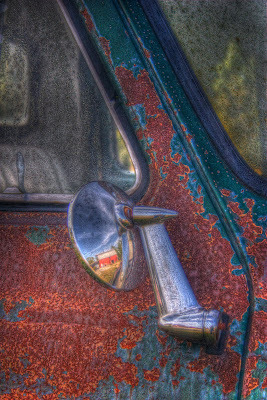 While there, I photographed this old Ford pickup truck rusting away in a nearby field. If I were making this photo today, I would have taken at least three exposures and tried HDR processing to capture the full dynamic range of the scene. Instead I was stuck with this single-exposure photo, which until now was languishing on my hard drive. I had always liked the composition. It has that little “gotcha” moment when you discover the barn reflected in the chrome of the passenger side rearview mirror. However, I didn’t like the lighting. The grunge look suits this photo. The rust really pops. And that barn reflection has never looked better. Canon 20D f/5.6 1/400 sec. ISO 400 18-55mm lens @ 35mm. Click here to view more pseudo-HDR grunge images.